The Pennsylvania Articles of Incorporation – For Profit | Form DSCB: 15-1306 is a standardized form which provides an outline for the basic information the Pennsylvania Bureau of Corporations and Charitable Organization requires. The Pennsylvania Bureau of Corporations and Charitable Organization operates within the Pennsylvania Department of the Secretary of the Commonwealth. This governing body must be satisfied in order for an entity to be able to operate as a corporation in the State of Pennsylvania. 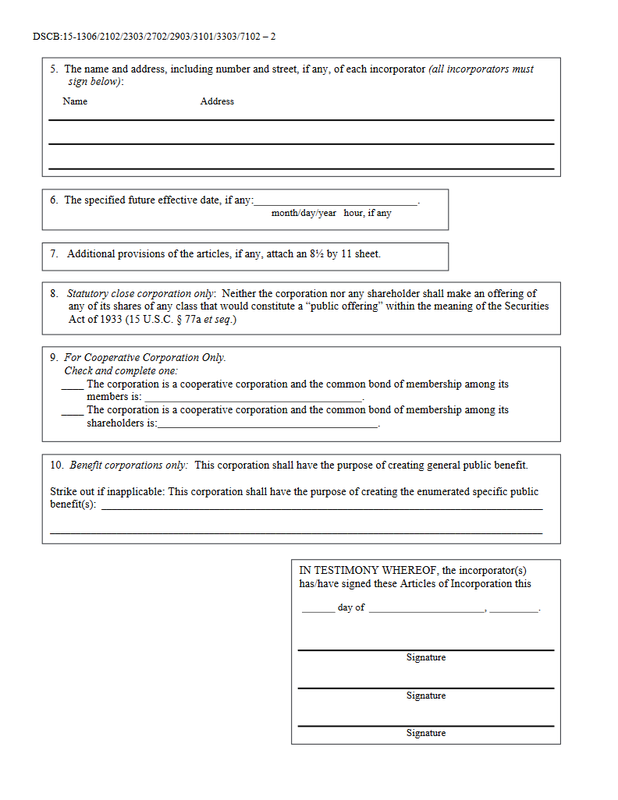 As mentioned earlier, this template form will require only the minimal information that every entity must submit to the Pennsylvania Bureau of Corporations and Charitable Organization. The requirements placed on separate entities will depend on their type and sometimes their location. For instance, an insurance corporation or professional corporation will need to satisfy the Pennsylvania Department of Insurance or the appropriate licensing boards (respectively) prior to seeking approval from this department. 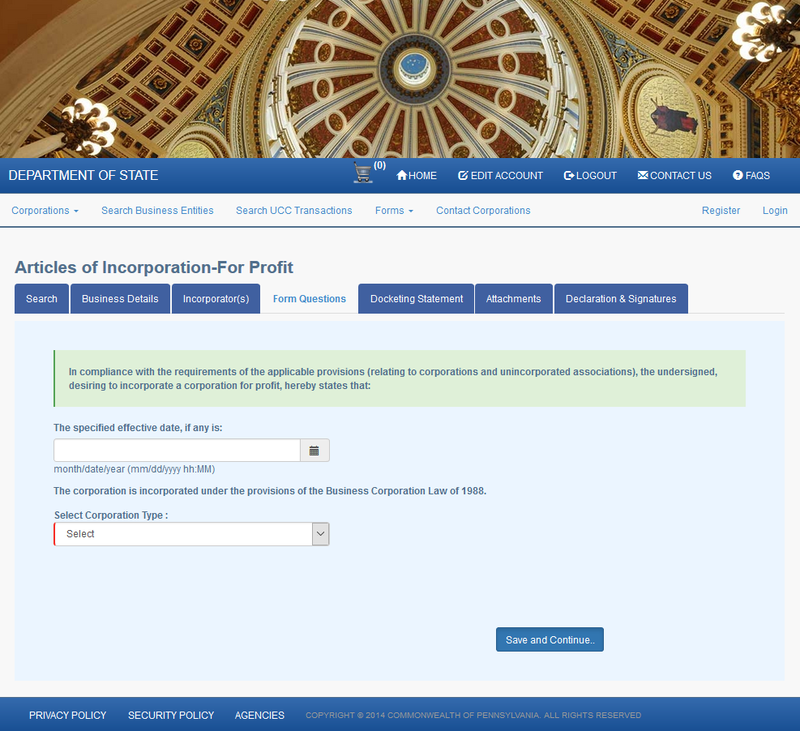 All forming corporations will need to submit all required paperwork, the Filing Fee, and a completed New Entity Docketing Statement (Form DSCB: 15-134A) with the Pennsylvania Articles of Incorporation – For Profit | Form DSCB: 15-1306. The Filing Fee for this document is $125.00. If you are filing by mail to: Pennsylvania Department of State, Bureau of Corporations and Charitable Organizations, P.O. Box 8722, Harisburg, PA 17105-8722, the submittal package must be paid with a check bearing an commercially imprinted Name and Address of the payee and must be made payable to “Department of State.” If filing online (www.dos.pa.gov/corps), you will need to pay this fee with a credit card. 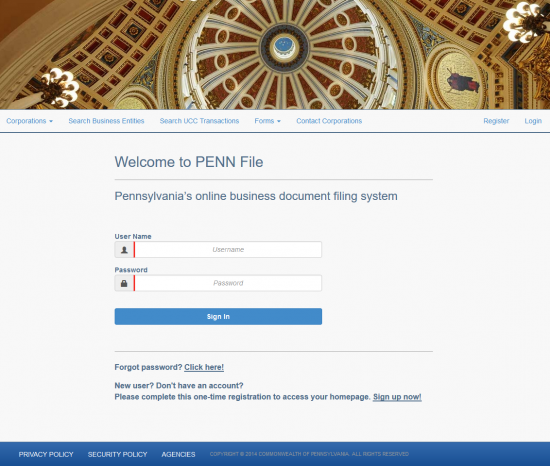 You will need a login with the Pennsylvania Department of State website to do this. 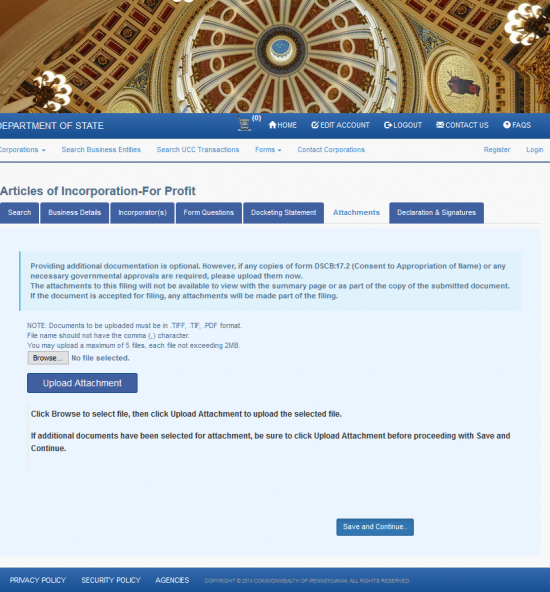 Step 1 - Download both the Pennsylvania Articles of Incorporation For Profit and the Pennsylvania Docketing Statement for a New Entity by selecting each one and saving the files. 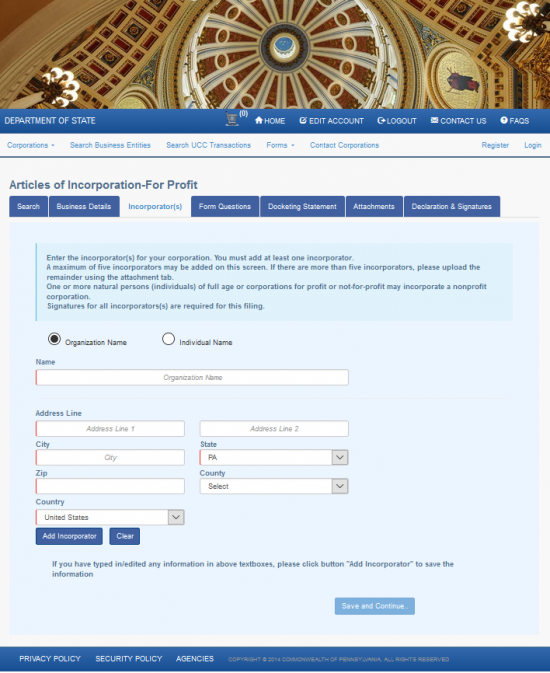 The Articles of Incorporation will register your corporation with the Pennsylvania Department of State while the Docketing Statement will report the Name, Tax Information, and Purpose of the corporation. These files may be edited with a PDF program or printed then filled out. (Note: If filling out by hand, it must be legible and in Blue or Black Ink). Step 2 - You will first need to indicate how the Pennsylvania Bureau of Corporations and Charitable Organizations may respond to you regarding these articles. To do this, locate the box in the upper left hand corner. There will be two check boxes. The first one will request all responses by mail while the second will request all responses by email. If you wish to receive a response by mail, then mark the first check box and enter the Name and Mailing Address of the recipient of this response. If you wish to receive your response by email, mark the second check box and enter the recipient’s email address on the line provided. Step 3 - Next, you will need to define the type of corporation being formed by these articles. You may do this by locating the line “Check only one” below the Fee statement. You will have a choice of several entity types, each one next to a check box. You may only choose one. Your choices will be: Business-stock, Business-nonstock, Business-statutory close, Management, Professional, Insurance, Benefit, or Cooperative. Choose one of these to proceed. Step 4 - In Article 1, enter the Full Name of the corporation being formed with the corporate designator or a generally acceptable abbreviation (Corporation, Corp., Incorporated, Inc., etc.). 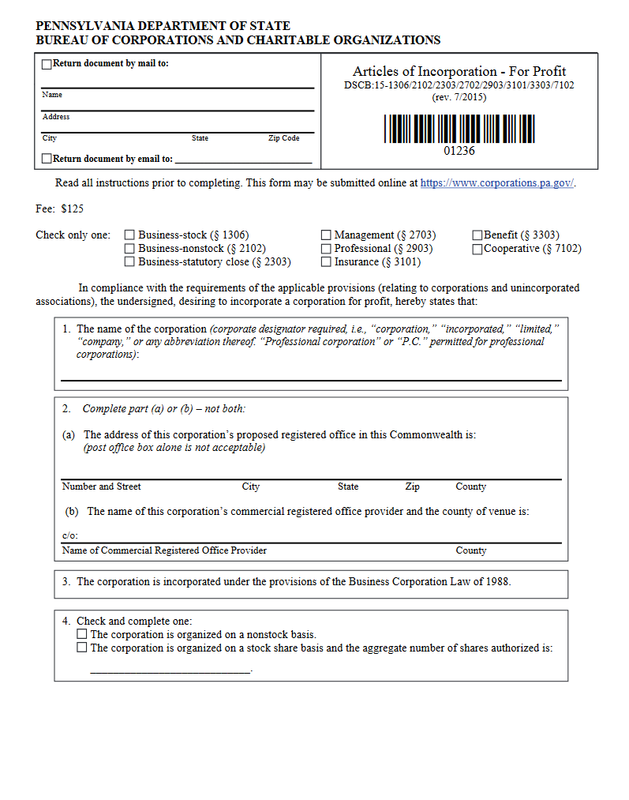 Step 5 - In Article 2, you must either report the Full Address where the corporation’s Registered Office is located if the forming entity has obtained a noncommercial Registered Agent in item 2a or the Full Name of the Commercial Registered Agent Provider and County of the forming entity’s commercial Registered Agent in item 2b. Note: If the corporation has obtained a noncommercial Registered Agent and must therefore fill out item 2a, a Physical Address must be reported. That is, this may not be a PO Box or something similar. 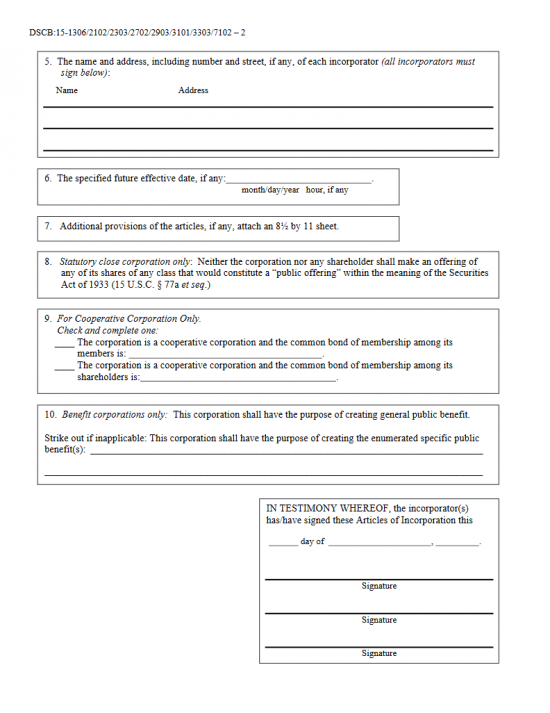 Step 6 – Article 3 binds this document and the incorporation of this entity to the Pennsylvania Business Corporation Law of 1988. Step 7 - Article 4 requires a definition to the authorized stock status of this corporation. If this corporation is being formed on a Nonstock Basis then place a check mark in the first check box. If this corporation is being organized with authorized stock shares then place a check in the second check box and enter the Total Number of Authorized Shares on the space provided. Step 8 – Article 5 will require the Name and Address of each Incorporator be listed. There will be three blank lines with an area for Name and Address. If this is not enough room, then continue the list on a separate sheet of paper that is clearly labeled. 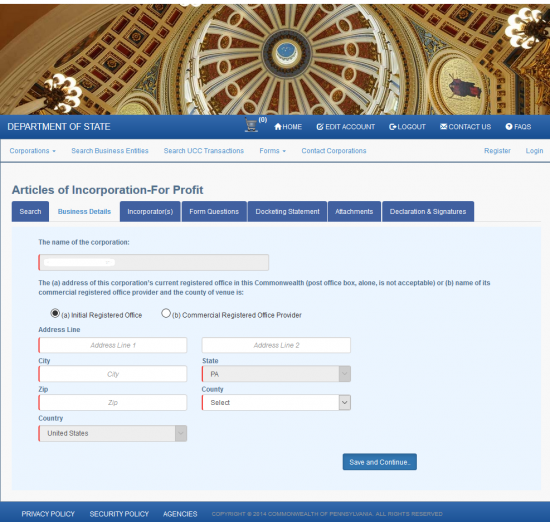 Make sure each Incorporator of this corporation has his or her Name, Building Number, Street, Suite Number, City, State, and Zip Code reported. Step 9 - You may wish a future Effective Date for these articles. That is, you may not wish to achieve corporate status on the Filing Date. If this is the case, report the Effective Date on the blank line provided in Article 6. Step 10 - Article 7 will allow for additional provisions to be attached to these articles. If you wish to take this option, then draw up a document on an 8 1/2 by 11 inch sheet of paper that is clearly labeled with any applicable specific provisions that must be included in these articles for this corporation to form properly. Step 11 - Article 8 will apply only to close corporations. If this is a close corporation, it may not offer any shares of any class of stock in any manner that would be considered a public offering (see Securities Act of 1933). Step 12 - Article 9 will apply to Cooperative Corporations only. You may only choose one of the options presented here. If the cooperative corporation common bond of membership applies to its members then place an “X” on the blank space next to the first statement then define the common bond of membership. If the cooperative corporation’s common bond of membership is between shareholders then place an “X” on the blank space next to the second statement then define that bond in the space provided. Step 13 - Article 10 will apply to Benefit Corporations only. If this benefit corporation a specific public benefit, report this on the blank space provided. If not, strike this line out. Step 15 - Each Incorporator listed in Article 5 must provide his or her Signature on the Signature Lines provided in this box. If there is not enough room, attach a sheet of paper with the rest of the Signatures. Step 16 - Next, you must fill out the “Pennsylvania Docketing Statement – New Entity.” Here you must document the corporations Name, the Tax Responsible Party, and provide a Description of the Business Activity. Make sure this document and all other required paperwork has been successfully completed and attached to these articles. Step 17 - Organize all documents then using a check with a commercially printed Name and Address make a check payable to “Department of State” in the amount of $125.00. If all the required paperwork has been completed and attached to the Pennsylvania Articles of Incorporation | Form DSCB: 15-1306. Step 1 - Go to the Pennsylvania Secretary of State Bureau of Corporations and Charitable Organizations Login page here: https://www.corporations.pa.gov. Step 2 – On your Dashboard page, locate the line labeled “Domestic Business Corporations” and select it. This will produce an area directly below this heading with several choices. 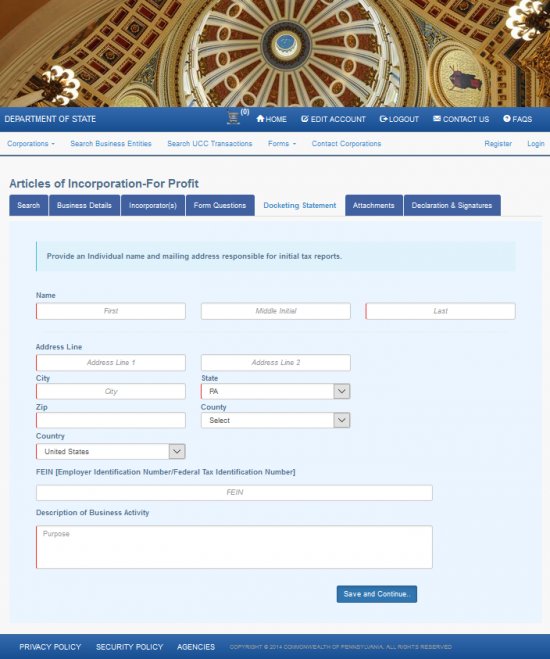 Select “Articles of Incorporation – For Profit (1306-2102). Step 3 - On the first page of the “Business Details” section, you will be required to divulge the identity of your Registered Office or Registered Office Provider. First, indicate if this is an Initial Registered Office or a Commercial Register Office Provider by selecting either the first or the second radio buttons respectively. For our purposes select the first radio button. Step 4 - Use the fields labeled “Address Line” in the first row of fields to fill in the Physical Address of the Registered Office. Step 5 - In the second row of fields, use the two fields provided to enter the City (in the first field) then select the State from the second field’s drop down list. Step 6 - In the third row of fields, enter the Zip Code (in the first field) then use the drop down menu to select the County. Step 8 - Each Incorporator of this forming entity will need to be reported on this page. First you will need to indicate if the Incorporator being reported is an Organization Name or an Individual’s Name. If this is an Organization, select the first radio button. If this is an individual, select the second radio button. For our purposes, select the first radio button. Step 11 - The Form Questions page will give an option of choosing an Effective Date (different from the Filing Date) in the first field. This field is optional. Step 12 - The second field on this page will ask to define the entity type. You must define what type of corporation is being formed by selecting Business-stock, Business-nonstock, Business-statutory close, Cooperative, Management, Professional, Insurance, or Benefit. This field is mandatory. For our purposes, select “Business-stock.” Once you have entered all the information required on this page, select the “Save and Continue” button. This will generate a follow up question below the drop down list. 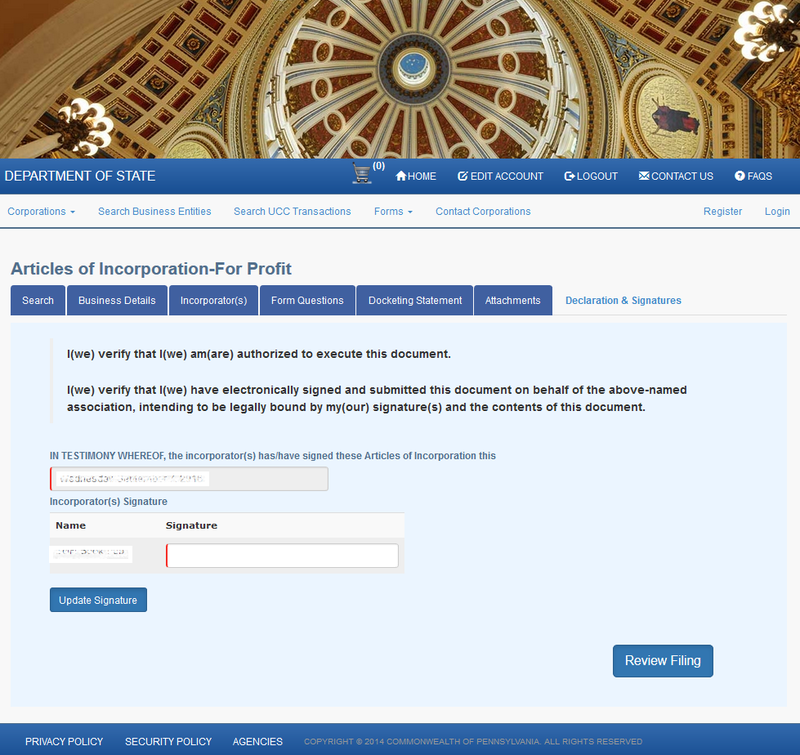 (In our example, you will need to verify the corporation is starting on a stock basis, then entering the Total Number of Shares authorized. Step 13 - The next page, “Docketing Statement,” will require the Name and Mailing Address for the individual responsible for Initial Tax Reports. You will need to report the Full Name of this party in the fields under the heading “Name.” Then report the Mailing Address using the Address Line, City, State, Zip Code, County, and Country fields. Below this enter the FEIN. Finally in the last field, report the Purpose of this corporation. Step 14 - You now have the opportunity to upload any required paperwork for your articles on the Attachments page. Use the “Browse” button to select a file from your machine then use the “Upload Attachment” button to upload the file to the system. You are not required to add an attachment to proceed to the next page but if you must submit any additional paperwork, it must be done here. Step 15 - The Declaration and Signature page will require the Electronic Signature of each Incorporator in the field corresponding to his/her/its Name. Once this is done, select the “Update Signature” button this will display each one in a table. This is the final step in filling out this form however once you select the Review Filing button, the browser will display all the information you will submit for a final edit. If it looks correct continue to the next area so you may enter your credit card information. You will need to pay the full Filing Fee of $125.00.